I had feedback from her Chinese tutor that she has not been doing her homework and she gave the excuse that she has too much school homework and has no time for tuition homework. I observed her for a week and realised that was not the case. She was spending too much time reading on her iPad and doing unconstructive things like packing her room and wasting her time doing what-not. I figured it was because she disliked doing Chinese compositions and comprehensions so she came up with excuses to avoid doing them. While we were out shopping, she saw a bag that she liked. I normally don't buy them things besides during Christmas and on their birthdays. However, I made a deal with her that if I were to buy her the bag, she had to finish all her tutor's homework from now on. She asked me, "How many more lessons?" I told her she had roughly 12 more lessons before the PSLE and that would be the end of tuition till the next major exam. "Deal" she beamed. Her tutor said that she has since kept to her word. After all the issues with the 2 older ones about their addiction to gadgets, I knew I had to put a stop to the younger ones before they get sucked in too. It was an opportune time to restrict #3's iPad and iPhone use as I realised she was also spending way too much time on them. Her class has a group whatsapp and it beeps incessantly with unimportant texts from her classmates which distracts her while she is doing her work. I took away her phone and told her she can only have it when she is out and needs to be contactable. This year, she has tuition for 3 subjects to plug the gaps - English, Chinese and Math. I have not given her Science tuition as her school teacher seems to be doing an excellent job with the entire class. She also makes an effort to come back on Saturdays to give them supplementary classes where she gets them to watch good videos to enhance their understanding. Her aunt is tutoring her in Math and I chat with her about her progress every 2 or 3 weeks. Sometimes, these quick chats throw up little problems here and there which we are able to address easily. For example, her aunt mentioned that because her Math tuition is back to back with her supplementary classes, she is brain-drained and can't concentrate fully. We solved the problem by giving her a nice little break in between. I would pick her up after class, take her out for lunch to give her mind a rest before heading over to her aunt's place. Even though I don't give her any additional stress at home, her school teachers are piling on the homework and going into overdrive as Prelims are round the corner. It is all the more necessary for her to relieve the stress and what better way than exercise. I've heard stories of children suddenly going blank during the PSLE exam due to excessive pressure. The good thing is that suddenly at this age of 12, she is getting more conscious of her body image and is motivated to exercise. Which is great as I don't have to nag her to go out and get some fresh air. Every evening, she will either cycle around our neighbourhood or go for a jog. I'm glad she is still able to stick to a 8.30pm bedtime on most nights. I truly believe they have to be well-rested to be able to focus well in school the next day. Somehow, #3 has no issues with not being able to finish her homework before bedtime. She is able to work smart and tries to complete as much of her homework as she can in school. I was curious how she is able to do this as I remembered #1 had a ton of homework during p6. She told me that there are several pockets of time which is just 'wasted', such as in between lesson changes, or when the teacher is settling admin matters or scolding some students. She will whip out her homework and quickly finish them. She even had time to bake her teacher cookies for her birthday! Sane tip: Although the PSLE is looming near, I don't feel the least bit stressed. I do the best I can as a mum, she does the best she can for herself, what more is there to ask for? Even at this juncture, the kids are picking up on what our underlying values are and I don't want them to get the wrong impression that studying is just to pass exams instead of the acquisition of knowledge, discipline and perseverance. Nor that family time, respect or responsibility can be thrown out the window just because a major exam is approaching. Save tip: The above 6 tips don't cost very much. For 6 things to do in the PSLE year, click here. For 6 tips to choose a secondary school that is right for your child, click here. 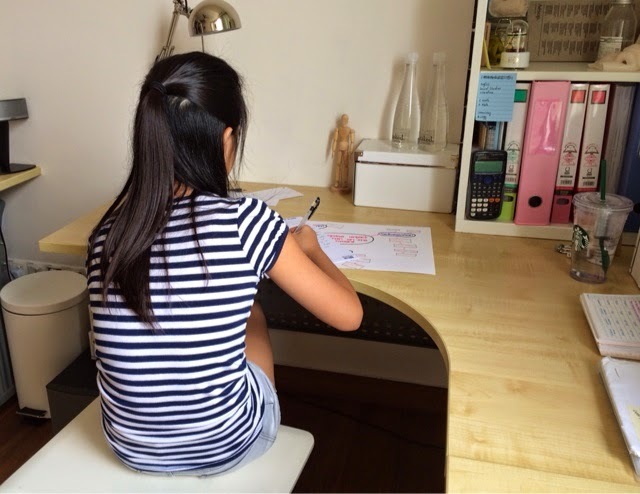 On how crazy the PSLE year can get, click here. With the proposed change in grading, "Who IS smarter?"